Turkish Politics in Action: Election Night . . .
Election results started to come out at six o'clock in the evening Turkey time, and it became evident early on that the AKP had a commanding lead of the popular vote. However, despite capturing a near 50% of voters, the largest percentage the party has captured since it first came to power in 2002, the party fell four seats shy of the 330 seats it needs in parliament (a 3/5 majority) to push through a constitution unilaterally. For an electoral map complete with official results, click here. This means that for the first time in a long time the AKP will have to engage in political bargaining (see yesterday's post). Last year the AKP successfully pushed through a series of constitutional amendments using its previous 3/5 majority before successfully submitting the amendments to referendum. 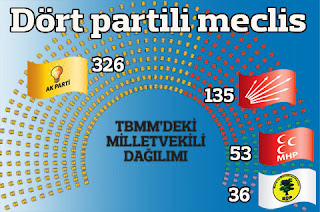 Meanwhile, the ultra-nationalist MHP managed to comfortably surpass the 10% threshold required for political parties to enter parliament, winning 13% of the popular vote. Though the party went from 69 to 54 seats, coming in above then 10% threshold made it difficult for the AKP to meet the 3/5 marker. The AKP's chances at gaining a 3/5 majority were further damaged by the historical success of the Kurdish nationalist party, the BDP. The BDP managed to pick up a whopping 36 seats (up from 20), no doubt a result in part to growing disenchantment with -- and, in many cases, outright hostility toward -- the party in Turkey's mostly Kurdish southeast. Running as independents so as to escape the 10% threshold, the BDP captured 6% of the vote. The AKP's nationalist turn, presumably an effort to win voters away from the MHP, had the predictable effect of alienating Kurdish voters. Ironically, as the only other political party competitive in the region, it also contributed greatly to its failure to win 3/5 of parliamenatary seats since the BDP fared so well. AKP's efforts to defeat the MHP were a gamble, losing Kurdish votes for ultra-nationalist votes (while at the same time empowering the BDP), and the party paid the price. In addition to MHP votes, the party did pick up a significant number of votes from the SP (Felicity Party), a legacy of Erbakan's National Outlook movement, consolidating its control over the Islamist vote. It also picked up votes from the center-right Democrat Party, which also harkens back to an earlier era. I would venture to say these are the blocs that explain the party's ability to increase its share of the popular vote. Meanwhile, the CHP, which took enormous risks this election cycle, performed under expectations. The CHP captured 26% of the popular vote to gain 38 seats (from 97 to 135), but some expected the party to poll over 30%. During the campaign, the CHP became by far the most progressive mainline party, taking positions more pro-European, pro-peace, and pro-liberal than the AKP (again, see yesterday's post). However, the party's controversial positions, especially on the Kurdish issue, may have alienated some in its formerly nationalist base -- votes that would have gone to the AKP or the MHP. However, nonetheless, CHP leader Kemal Kilicdaroglu and ""the new CHP" managed to gain almost 3.5 million new voters and pick up seats. Whether the CHP will continue to steer Kilicdaroglu's chart or be so frustrated with the results that it changes course once more remains to be seen. In his acceptance speech, Prime Minister Erdogan vowed to build consensus on a new constitution and reiterated that he represented all Turkish citizens, not just those who voted for him. Prime Minister Erdogans aid the consensus would be built among political parties and civil society groups, all of which would be consulted during the process. However, the prime minister made the same promise last year and fell short. All parties support drafting of a whole new document to replace the country's 1982 constitution drafted under military tutelage, but just what will happen in the coming months is very much up in the air. The AKP is far from weak, and could well gain the 3/5 majority it needs without too much maneuvering. UPDATE I (6/13) -- For a truly wonderful electoral map complete with candidate names according to the provinces from which they were elected, click here. The AKP won more provinces along Turkey's more secular Western coast than it has in the past, but this should not be read as a significant setback for the CHP. Though the CHP no doubt lost votes in some of these Kemalist/nationalist strongholds, including majorities, it seems to have widened its support throughout the country, picking up votes in provinces where before it was not at all competitive.